Reminder: One more day to enter my holiday giveaway (US only)! I remember one of my first posts on this blog was titled "It's Not Easy Being Green". Green nail polish and I never mixed well. I never really was attracted much to greens under the assumption they don't look good on me. Well, things have changed. I've noticed in the last month I've been purchasing lots of greens. I think it's a matter of finding the right greens. I love deep rich greens and medium greens. I especially love greens with sparkle or shimmer. I feel silly for passing up on this Zoya the first time, but I'm glad to have it now! Ivanka is a true emerald green with gold and green glass fleck glitter. This is a spectacular color! This one is from the Zoya Sparkle summer collection. Every time I saw swatches of this I swooned over this color, but passed it up because of my previous experiences with green. I'm glad I changed my mind. I shouldn't of dismissed an entire color family. I was missing out, but I'm making up for it now. I love me some green! I have been wanting this for sooo long!!! I was bummed to miss the BOGO sale :(:(. I think it looks great on you and you need more greens! I can't imagine why I haven't worn this one yet--so pretty! Very unique color. Looks great on you. Wish Zoya was easier to come by over here. I totally hear you about being finicky about greens! I can only wear warm toned greens. Oh well...at least I can wear some! I love green polishes of all kinds, and this one is no exception! I'm ALWAYS on a green kick! 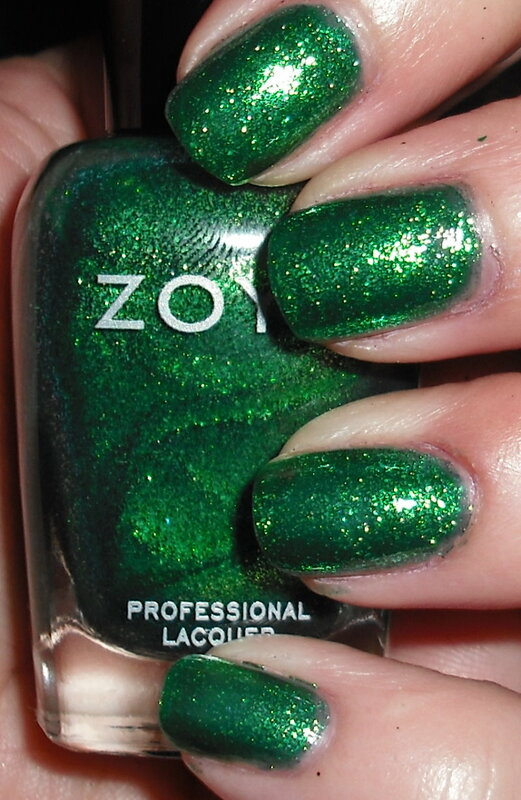 This is one of my fave Zoyas and looks great on you! I like this shade on you; it's very Christmas-y!